Growing up in western New York, Laura Joss had very limited exposure to national parks—or park ranger careers. But as a junior at Indiana University, she had the opportunity to work as an intern at Mesa Verde National Park in Colorado. Building upon that volunteer work with the park’s museum collection, Laura landed her first paid National Park Service (NPS) job in 1989 at Glen Canyon Recreation Area in Arizona/Utah, where she met her husband, Skip Meehan, also a longtime NPS employee. From Glen Canyon, Laura embarked on a Park Service career that led her to criss-cross the country—from Yellowstone National Park in Wyoming to Fort McHenry National Monument and Historic Shrine in Maryland to Arches National Park in Utah—managing and caring for natural and cultural resources alike, in parks large and small, urban and rural. Those varied experiences have prepared Laura well to serve as the new General Superintendent of Golden Gate National Recreation Area. Since starting as the top ranger last November, Laura has been busy learning the complexities of the Golden Gate National Parks, but Park E-ventures was able to squeeze into her schedule for an illuminating conversation. You’ve worked in so many capacities, at eight different national park sites across America. What do you enjoy most about being a ranger? Working to ensure thriving, healthy places that are safe and welcoming to all—particularly to young people. What I enjoy most is getting out into parks and experiencing the amazing splendor of these areas—and then sharing that with young people, especially in densely populated urban environments. I’m finding out that there are young people [in this area] who have never seen the ocean...so I consider it my mission to get those young people out to our parks, and teach them about these resources so that they are as excited about these lands as many of us are. Once they have that direct connection to these fantastic places, we hope they’ll work with us to ensure that these parks are preserved for the future. What’s the secret to making that special connection between young people and these parks? Instilling a sense of discovery and mystery…to find that special way that each of us discovers and makes an emotional connection to a place. And it’s different for everybody. That’s the tough thing to identify—whether it’s through visual means or scent or touch, everyone learns and experiences in different ways. The challenge then is: what can we do to make all of those opportunities available, so that each person makes that connection and transforms their lives in a positive way? Speaking of connecting with a place…do you have a favorite spot at Golden Gate? I particularly love the Marin Headlands. It’s such a unique combination of our nation’s history and natural beauty…you can walk for 15 minutes and go from a busy urban setting overlooking the Golden Gate Bridge to a very quiet, wild, and restful area. I’ve seen bobcat and other types of wildlife after taking just a short walk away from the road. To me, the Marin Headlands combines all of the unique aspects of this national recreation area. What’s your favorite national park, out of all 417 units under the National Park Service? That’s a very hard question; having lived and worked in so many parks, I love each of them for their own unique characteristics. But Arches [where I was superintendent for four years], with its spectacular and mysterious landscape, has a very warm spot in my heart. As a family, we lived in a house in the park, and were all able to explore the park together. We each had our favorite places. It’s where my children came to learn to enjoy hiking, and bringing friends to the park. You were most recently Regional Director of the Pacific West Region, which encompasses 63 park units, including Golden Gate. What did you learn in that role? It taught me about many of the successful programs and partnership models that the Pacific West Region has developed. The prime example of that is Golden Gate National Recreation Area, with the Golden Gate National Parks Conservancy and Presidio Trust. Those partnerships are seen as national models for the Park Service. When I was appointed to this position [at Golden Gate], I was so honored to be able to work directly with the Conservancy and the Trust, and continue the innovative programs that this park is so well-known for, throughout the National Park Service. What, in particular, has impressed you about the partnerships here in the Golden Gate National Parks? 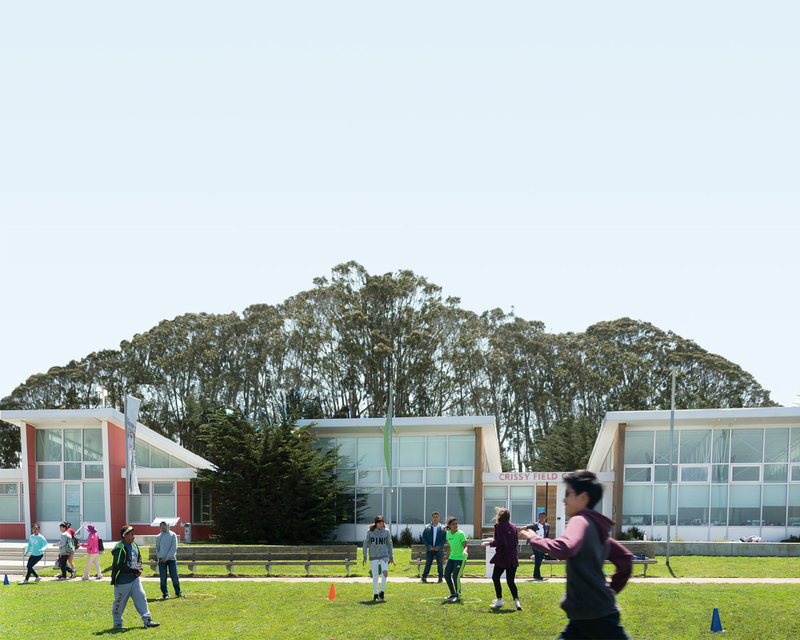 The partners at Golden Gate—the Parks Conservancy, Presidio Trust, and 50 other partners—are extremely active and vital, and they have a very deep connection to the community that is so proud of these parks. They work with the National Park Service on our highest priority issues; for example, the Conservancy has worked with the Park Service to accomplish a great deal of historic preservation work on Alcatraz, while the Presidio Trust is maintaining the historic structures in the Presidio in amazing condition—and planning for future improvements. These very dynamic and collaborative partners have a unique ability to take the pulse of park needs—and the willingness to work with and share successes with the Park Service. I can’t say enough about how much the Conservancy and Presidio Trust contribute to our success at Golden Gate. And Golden Gate employees are highly creative and innovative; the park is known to have incubated pioneering ideas that are often picked up as National Park Service models nationwide—such as our approach to accessibility in the national parks. What are some of the unique challenges facing the Golden Gate National Parks? The three parks here—Fort Point National Historic Site, Muir Woods National Monument, and Golden Gate National Recreation Area—make up such a vast and complex landscape, with numerous natural and historic resources. The challenge is educating the public about them so that they appreciate the gift of these wonderful places, learn about them, and take care of them so that these treasures are preserved for future generations. Another challenge is, in such a high cost of living area, recruiting and retaining a diverse and thriving workforce that reflects our nation. How can this park better serve the diverse communities of the Bay Area? I really think the programs that the Parks Conservancy, National Park Service, and Presidio Trust have developed are very successful at reaching diverse communities and making national parks relevant. For example, the new Presidio Visitor Center—which is jointly run by the three organizations—is a wonderful model of collaboration and provides unique opportunities for visitors to get connected to park resources. I was impressed with the hands-on exhibits and activities—and the thought that went into educating the public about our history at the site. And I’d like to make the park more family-friendly. I know how daunting the logistics can be for families to prepare to visit a place like this, and I’ll do everything I can to make sure these parks are as welcoming as possible. What do you hope your legacy will be at Golden Gate? I hope that legacy represents my goals of: Caring, Sharing, and Connecting: to continue caring for these amazing places so they’re preserved for the future, share them with our community and our nation, and work with our partners to provide opportunities to make meaningful connections—especially for young people—to these special places. What other parks would you like to visit, either here in the U.S. or abroad? My current goal is to get to know Golden Gate, Muir Woods, and Fort Point better—that’s 80,000 acres of national parkland to explore! I would love, in the future, to visit the national parks in Costa Rica because they also have managed to create a model of protecting resources, while at the same time welcoming international visitors in a sustainable way. I’d love to see some of their operations and resources. My kids tease me that whenever we go to national parks I always want to visit the maintenance facilities! They’re not often thought of as the first things to visit in a national park, but to me they’re a window into how the parks are cared for by the employees. You’re a ranger through-and-through. Even when you travel, you’re working!